Employee users can be configured to log into Employee Portal or web applications built using Interconnect. Open the Employee Master Data record in SAP Business One. Go to: Human Resources > Employee Master Data and find the Employee. 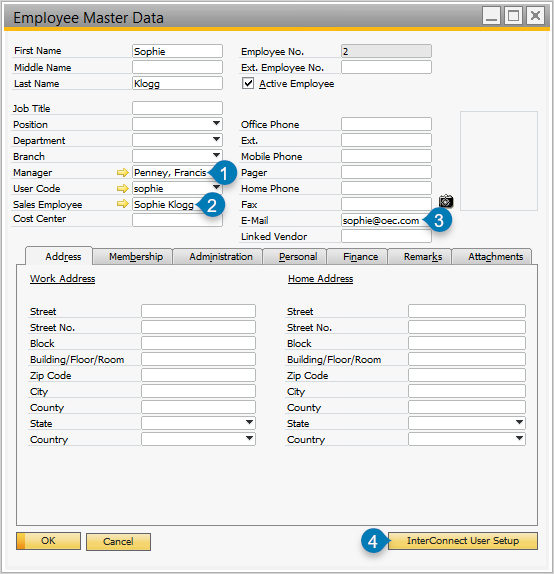 SAP Business One Employee Master Data record. Assign a sales employee (2) and ensure an email address is assigned (3) before proceeding to configure the Portal User (4). For Expense Users, ensure Manager is assigned (1). Ensure there is an email address assigned to the Employee, as shown in the screenshot above (see marker 3). Without an email address, the user will not be able to log in. This email address must be unique. Ensure that a Sales Employee is assigned to the Employee Master Data, if Sales information will be used. If Named Sales User licenses have been purchased, then Sales Employees are required. If sales-specific queries are not used, then this field may be left blank. See Sales Employee field in the screenshot above (see marker 2). For Expense Users, ensure Manager is assigned to the employee (see marker 1). Without a manager, approvals may not be correctly assigned when the user creates Expense Requests or Expense Claims. Save all changes before proceeding by pressing the Update button. Use the InterConnect User Setup button to open the Portal user configuration screen, as shown in the screenshot above (see marker 4). Once the Portal User has been opened, fill in all Roles details as described below. For Employee users, configure Expense User details only if applicable. Employee user Roles section. Note that there are two tabs (Roles and Expense User). The following system roles are installed by default, and do not include optional sample roles. Additional roles may be optionally configured. Credit Card Import Expense User Grants access to the Expense User Credit Card Import feature as an end-user. Note that Credit Card Import must be enabled, and the configuration setting Enable End User must be turned on. Credit Card Import Admin Expense User Grants access to the Expense User Credit Card Import feature as an administrator. Credit Card Import Admin users should also be assigned the role Credit Card Import. Administrators may import credit card files and assign them to other Expense Users. Note that Credit Card Import must be enabled. Dashboard Standard Grants access to the Dashboard functionality. Additional roles may be required to see specific dashboards. Dashboard Admin Standard Grants access to the Dashboard administration page. Add the Dashboard role in addition to this role to ensure full dashboard access. This does not grant global access to dashboards. Additional roles may be required to administrate specific dashboards. EditLayout Standard Grants access to Report View editing, if this feature is enabled. Expense Admin Expense User Grants access to all expense-related reporting, including other’s data. Expense Booking Paying Expense User Grants access to the Expense User booking queue. Expense Reports Expense User Grants access to expense-related reporting. Expense User Expense User Do not add or remove this role, instead use the Enabled Expense User check-box on the Expense User tab, and this role will be updated automatically. Grants access to Expense User, if this feature is licensed. GL Override Expense User Do not add or remove this role, instead use the Allow user to override account segment filtering check-box on the Expense User tab, and this role will be updated automatically. Grants the ability to manually select the GL Account associated with an expense type. Sales Exec Sales User Version 92.7 and higher. Grants access to advanced Opportunities and Activities reporting. Provides visibility into Opportunities belonging to any user. Note: This role does not have the ability to edit Activities. As of version 93.3, this role provides the licensed user with access to place/update orders and quotes on behalf of all customers. Note that “Search Customers”, “My Customers” and “List All Customers” reports display only directly assigned customers. Other user’s customers may be accessed using Place Order customer search or within the customer details page for a customer. Sales Manager Sales User Grants access to advanced Opportunities and Activities reporting. Provides visibility into Opportunities belonging to this user’s subordinates (sales people who have this employee assigned as their manager). As of version 93.3, users with this role have access to their subordinate employees customers. That is, “Sales Manager” users can place orders/quotes against customers who belong to employees whos B1 manager is this user. Sales User Sales User Grants access to Sales User features and basic reporting. Grants the user access to edit their own customers and opportunities. - Sales User basic reports related to the current logged-in sales person. Super Standard Grants access to administrative reporting. ZB1EPS Sales User Grants access to Sales User 1.0 features and functionality. Employee users may be configured to access this admin tool. WorkFlowAdmin Grants access to administrative screens of the Workflow Portal for InterConnect. Expense User configuration is only required for users who wish to use the Expense User features. An optional Expense User license must be available before a user can use Expense User features. 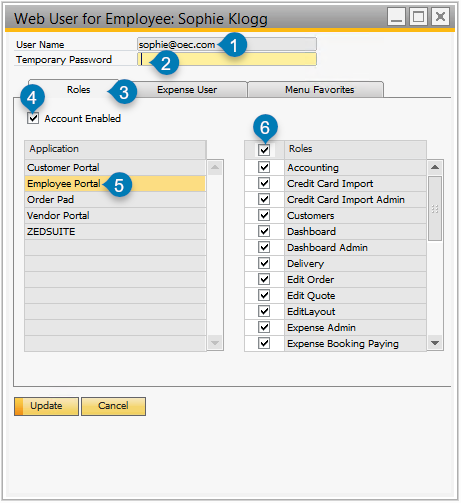 See Configuring Expense Users for Employee Portal for a walkthrough of Expense User setup.